As part of their Jass Award, Primary 7 were busy on the last day of term litter picking around the marina. Our thanks goes to Mid-East Antrim Council for facilitating our volunteering in the local community. P7 Mrs Kirkland bid a fond farewell to Miss Oxley today. Having a Canadian student teacher has broadened their horizons and their tastes! We were very pleased to enjoy the traditional Canadian treat of buttercream tarts this morning. Thank you Miss Oxley! P7 have had a very successful day at the Young Enterprise Fair at the Abbeycentre today! Well done to Gabriella for winning Best Sales Person out of all schools represented today. Primary 7 are building on their previous entrepreneurial experience as they prepare for a larger market at the Abbeycentre in April. Production lines of Easter crafts to be sold at the Young Enterprise fair are well under way. 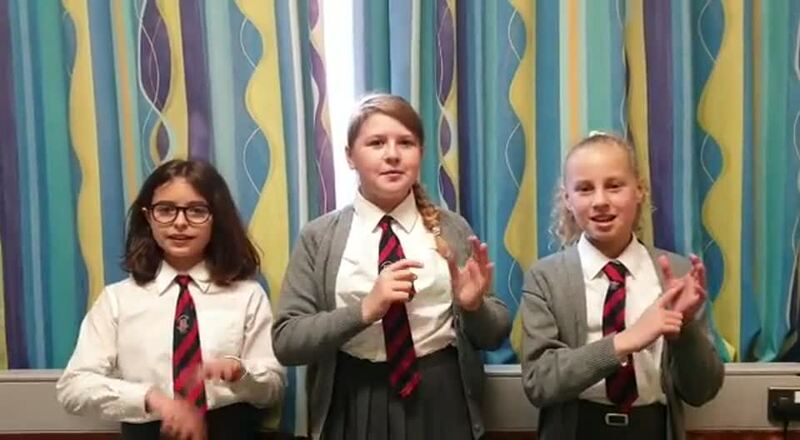 Our Makaton lesson in P7 this week was signing to 'I can sing a rainbow'. 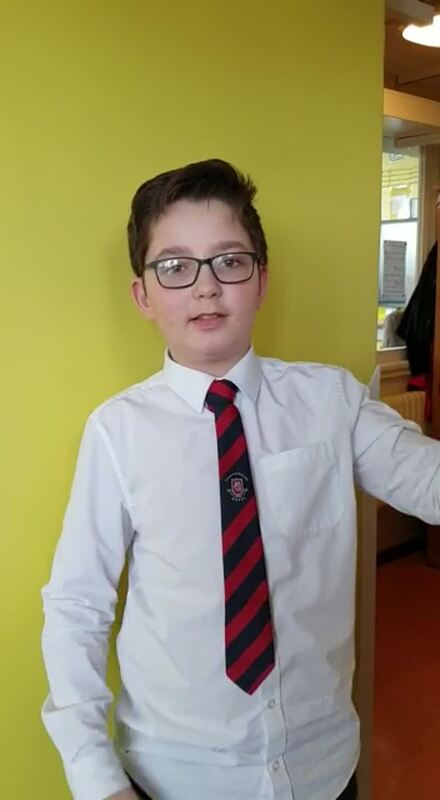 Watch the pupils in the video below. Primary 7 pupils have been very industrious in undertaking their WW2 project homeworks this month. We have been very impressed with their creativity, ingenuity and enthusiasm. Plenty more to come but we've been very impressed with air raid shelter models, battle scene line drawings, ration book recipes (we've sampled some vet tasty chocolate cake) and even a WW2 song composed to boost morale! Boosting Brain Power in P7! These mathematical whizz kids are determined to successfully complete a challenge on calculating the unknown angles in polygons. We think they are well on their way to be prepared for Year 8 already! 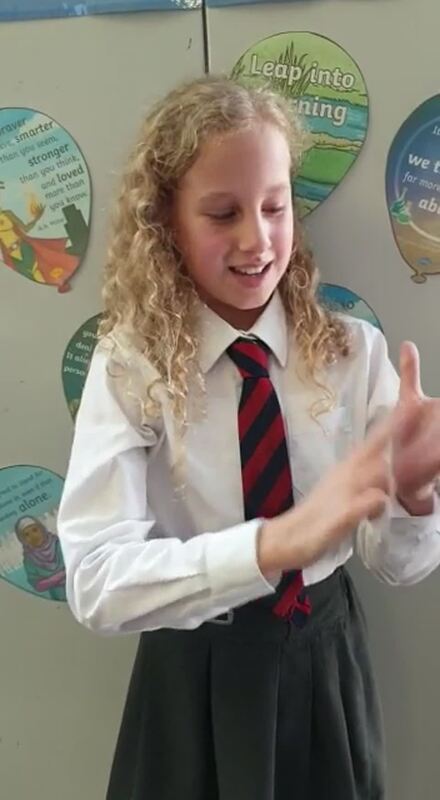 On Fab Friday, Primary 7 have been learning their alphabet all over again - this time in Makaton. P7 are busy working towards their Jass awards at the moment (similar to Duke of Ed). 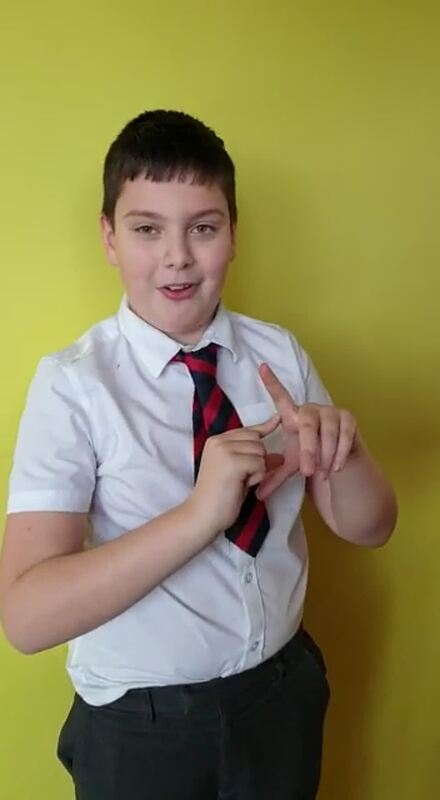 One if the new skills they have been learning is Makaton sign language. We are all learning together! On Tuesday, P7 participated in the council led Agents for Change workshop exploring cultural diversity. Gambian dancing was a big hit! As part of our financial capabilities topic, today in P7 we enjoyed playing Monopoly. This helped us to understand the risks involved with investments, but also the possibilities of gaining large financial returns from investments! This week on Fab Friday, P7 have been playing monopoly to compliment their learning on financial capability this half term. There are certainly some budding real estate agents of the future in the Model today! A big thank you to everyone who supported P7 in their 'model' businesses. P7 pupils have learnt about many aspects of business including the importance of communication and working as a team. 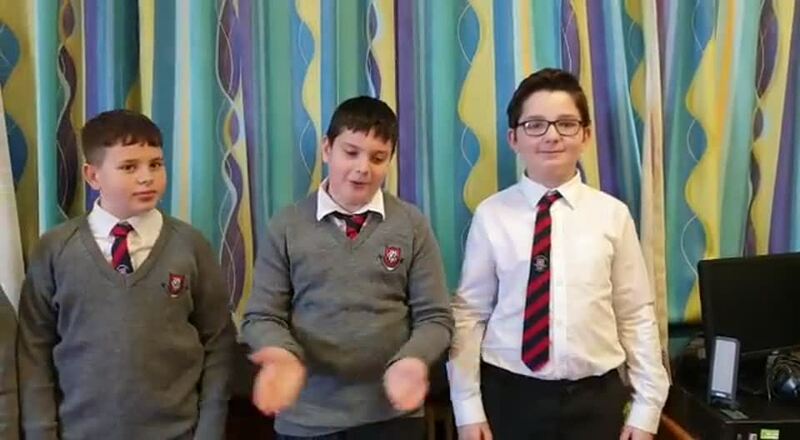 Some P7 pupils represented our school, at a second road safety quiz in a week, at Carrickfergus Town Hall today. Congratulations to this dream team on 2nd place this morning! Primary 7 Production Managers are very busy at the moment ensuring all their products are ready for the Model Mini Enterprise Fair on Tuesday morning. Bring £1 or two along to sample some of the many different items on offer. The model enterprise is progressing well with groups being given the opportunity to buy products from Sainsbury's. On their return they started to put together their products to be sold next Tuesday! All of P7 worked together alongside representatives of the Young Enterprise programme this week. Our budding young entrepreneurs received expert advice from business people currently working for PwC and a local broadband company. They are hoping to put their latest plans into action very soon! Primary 7 budding entrepreneurs have been put through their paces over the last few days in the Model Dragons' Den in a bid to secure a loan from school funds for their fledgling enterprises. What an array of presentations and sample products were pitched to the 'dragons.' A big thank you to our guest 'dragon' and to the many mums and dads who are helping P7 in the background too! P7 have continued to be busy working on their Model Enterprise projects. Today they carried out their market research to find out which products will be most popular with their target audience. P7 are embarking on their own 'Model Enterprises' over the next few weeks. To help launch this project, a P7 parent and successful entrepreneur, Mrs Kennedy, visited our pupils to offer expert advice on setting up your own business. Primary 7 learned how communication is everything whether it is marketing your product or working as part of a team. They even got some tips on how to present their business ideas to the 'Dragons' Den' later on this week. We greatly appreciate Mrs Kennedy taking time out to speak to P7 this week. Primary 7 went to Legg Park last week for a tree planting event in memory of the Holocaust victims. They helped to plant a tree, then hung labels on the branches, each with a child’s which for the future written on. They also took a day to look at the events of the Holocaust and the significance of this in history. Primary 7 have been working very hard on creating their own papier mâché Solar Systems over the last few weeks. Not quite to scale but the gas giants were definitely larger than the terrestrial planets! Did you know that Earth is the only planet in our solar system where a total solar eclipse can occur? On Friday P7 were looking at the stars in daylight. They used the SkyView app to locate star constellations by looking up and down(!) whilst walking around the school environment. They had the whole Milky Way in their sights. P7 have been working enthusiastically on their post-AQE 'space hotel' projects. They are still under construction but promise 'eco-friendly' accommodation at an affordable price. They are simply out of this world! Fab Friday in Primary 7 this week centered around the challenge of designing a capsule to keep an egg safe when dropped from a height. Our eggnauts were so successful that we had to conduct a second test from a greater height outside. Toby's team won the prize for the best teamwork and Shiori's group for the best eggnaut design. This bodes very well for some future female engineers! P7 pupils have been exploring their creative scientific side this week by making robotic hands. Just look at their wonderful creations in the pictures below.